Decision making pervades every aspect of life: people make hundreds of decisions every day. The vast majority of these are trivial and without a right or wrong answer. In some respects there is also nothing extraordinary about pilot decision making. It is only the setting that is different - the underlying cognitive processes are just the same. However, it is the context and the consequences of a poor decision which serve to differentiate aeronautical decision making. Decisions on the flight deck are often made with incomplete information and while under time pressure. The implications for inadequate performance is much more serious than in many other professions. Poor decisions are implicated in over half of all aviation accidents. This volume contains key papers published over the last 25 years providing an overview of the major paradigms by which aeronautical decision making has been investigated. Furthermore, decision making does not occur in isolation. It is a joint function of the flight tasks; knowledge; equipment on the flight deck and other stressors. 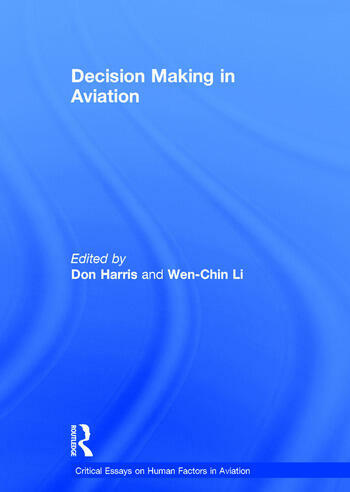 In this volume of collected papers, works from leading authors in the field consider all these aspects of aeronautical decision making. Contents: Introduction. Part I Approaches to the Study of Aeronautical Decision Making: Taking stock of naturalistic decision making, Raanan Lipshitz, Gary Klein, Judith Orasanu and Eduardo Salas; Aeronautical decision making: metaphors, models, and methods, David O’Hare; Force management decision requirements for air force tactical command and control, Joseph G. Wohl; Why classical decision theory is an inappropriate standard for evaluating and aiding most human decision making, Lee Roy Beach and Raanan Lipshitz; Decision-making in the cockpit, Judith M. Orasanu; Judgement and decision making by individuals and teams: issues, models, and applications, Kathleen L. Mosier and Ute M. Fischer. Part II Training Aeronautical Decision Making: Decision making training for aircrew, Glyn David; Enhancing aeronautical decision making through case-based reflection, David O’Hare, Nadia Mullen and Adele Arnold; Training the naturalistic decision maker, Marvin S. Cohen, Jared T. Freeman and Bryan B. Thompson; A systems approach to training aeronautical decision making: from identifying training needs to verifying training solutions, W.-C. Li and D. Harris. Part III Automation and Aeronautical Decision Making: Humans: still vital after all these years of automation, Raja Parasuraman and Christopher D. Wickens; Automation and decision making, Jan Noyes; Automation bias: decision making and performance in high-tech cockpits, Kathleen L. Mosier, Linda J. Skitka, Susan Heers and Mark Burdick; Automation bias in intelligent time critical decision support systems, M.L. Cummings; Impact of automation on aircrew communication and decision-making performance, Clint Bowers, John Deaton, Randy Oser, Carolyn Prince and Michele Kolb. Part IV Distributed Decision Making: Flight decks and free flight: where are the system boundaries?, Erik Hollnagel; The breakdown of coordinated decision making in distributed systems, Christopher Bearman, Susannah B.F. Paletz, Judith Orasanu and Matthew J.W. Don Harris is Professor of Human Factors at Coventry University, UK and Wen-Chin Li is Senior Lecturer in the Department of Air Transport at Cranfield University, UK.